TN TRB Polytechnic Lecturer Recruitment 2018-2019 Notification is about to release. Therefore, all the contenders who are checking for the correct place to know about this Recruitment can check this post completely. As per the data in the advertisement, we got from the official site of Tamil Nadu Teacher Recruitment Board, contenders will have a chance to apply for the 1065 Polytechnic Vacancies. But remember that the applicants need to have had all the Qualifications correctly as of on time of applying. Now, the officials of TN TRB has not mentioned anything about the important dates such as the closing date and Starting Date. But please stay tuned for this article, so that you will know about the important date. We will update the dates here in this post, as soon as the Officials release a Notification with the Commencing and Deadlines. More information is available in next parts. TN TRB Polytechnic Lecturer Recruitment 2018-2019 Notification is surely a good chance. Please do not waste this if you are searching for the Jobs in Teaching Field. Now, as per the clear source in the Annual planner, the officials of the TN TRB are going to release the complete notification in the 1st week of May 2018. Therefore, to reduce the search burden for the contenders, here we are initially updating all the information. And soon after the officials of the Tamil Nadu Teacher Recruitment Board announce the official advertisement, we will update them all here on this page. Therefore, hereby we suggest all the people, to follow this article, closely. We will defiently update. Now, all the details giving on this page are only to refer and for headstart purposes. So, check them right now. So, that you can apply when the date starts. Now, for the convenience and comfort of the Job Hunters, we have placed a table in the middle of this post. Therefore, all the people who are interested in getting the details about this TN TRB Polytechnic Lecturer Recruitment 2018-2019 Notification should check them without a miss. This contains all the important information that is necessary to have by the applicants. Please remember that the contenders need to have the requirements as of on date of applying. Because the officials of the TN TRB are looking for the people who are eligible and have had all the Qualifications. If not they are going to reject the applications immediately. So, consider this and carry on forward to know more about this Recruitment. TN TRB Polytechnic Lecturer Recruitment 2018-2019 Notification clearly mentions that all the applicants must and should have the correct Educational Qualification. Remember without the proper qualifications, your application form is invalid. As per the source in the advertisement, the officials of Tamil Nadu Teacher Recruitment Board are looking for candidates with particular educational Qualification only. Data in the TN TRB Polytechnic Lecturer Recruitment Notification clarifies that to apply for this post, all the applicants need to have finish either Graduation or Post Graduation as the Educational Qualification. Please go forward only if you are having the above stated as the educational Qualification, otherwise, you can check the other Recruitment Notifications that are available on our site Freshersnow.com. Other details about this TN TRB Polytechnic Lecturer Recruitment 2018-2019 are given in next sections. Next priority to apply for the TN TRB Polytechnic Lecturer Recruitment 2018-2019 goes to the Age limit. Having correct age along with the Educational Qualification is an added advantage. Basing on the information in the TN TRB Polytechnic Lecturer Recruitment 2018-2019 Notification, the Minimum age can be 21 years. Also, the maximum age can be 57 years. Please remember that there is some age relaxation available. So, the contenders who are willing to find out can check the advertisement. For the sake of the candidates, here at the end of this article, we are giving the link to the official TN TRB Polytechnic Lecturer Recruitment 2018-2019 Notification. Just by clicking on the link, the contenders can download the advertisement. This article is made to help all the people who are endlessly looking for the source to get complete information. 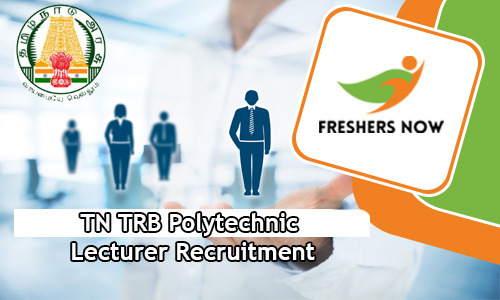 More other information about the TN TRB Polytechnic Lecturer Recruitment 2018-2019 is listed in next sections. Now, according to the trusted sources, the people should pay the Application Fee. And the officials of the TN TRB has already fixed the application fee. According to the data in the advertisement, the General and OBC people should Pay Rs.500/- while the SC/ST/PWD category contenders have to pay Rs.250/-. Please consider in checking the advertisement twice before making the payment. Now, after submitting the Application form, the officials will ask the contenders, to attend the recruitment rounds. By considering both merit and Performance in those rounds, the officials will finalize the candidates. So, all the applicants have to prepare and perform well. As per the information in the TN TRB Polytechnic Lecturer Recruitment 2018-2019 Notification, the applicants have to clear the Written Examination along with the Personal Interview. A contender will go to the next round only if they clear initial rounds. Keep that in mind. And the officials are even offering a better salary for the applicants. According to the data in the advertisement, Selected people will get around Rs.9,300 to Rs.39,100/-Per Month as the salary. Rs.9,300 to Rs.39,100/- Per Month. First, Check the official site of TN TRB at trb.tn.nic.in. Search for TN TRB Polytechnic Lecturer Recruitment 2018-2019. Refer the details given in the advertisement. Recheck and submit the application form by the closing date.